For lunch today, we stopped for lunch at Chicago on a Bun. It's located in the Renaissance Towne Center, a little strip mall in the middle of tons of new-ish housing. The restaurant's filled with Chicago memorabilia and I believe they bring in the ingredients from Chicago-based suppliers. My last review ended with a comment about having Costco's polish dog for less and I'd say that thought repeated itself again this time. The last few times I've been here, it's been pricey but good. This time, the Polish dog was dry and they really skimped on toppings. I had ordered grilled onions, which didn't happen. The kraut that's visible on the left side? That's all there was. The dog was grilled to dryness and not juicy at all. 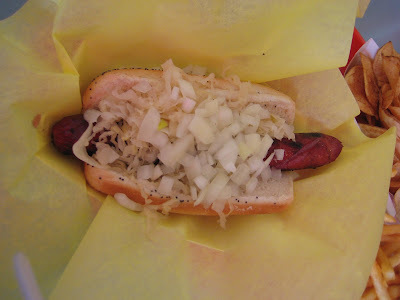 D.'s Polish dog had a meager sprinkling of grilled onions. In the past, the onions were piled on dog and the dogs were juicy and plump. The best part of the meal were the chips and the fries. 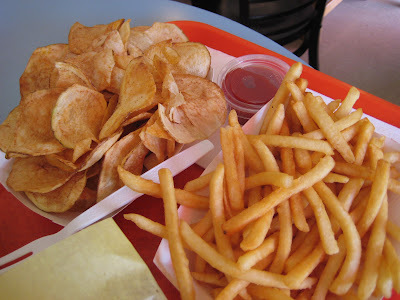 Potatoes are sliced at the perfect thickness and fried crispy for great chips. They're not too thin and not too thick. 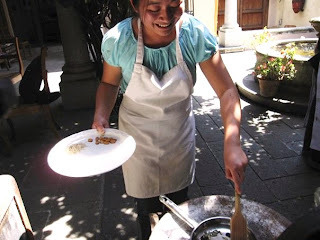 They were fantastic, but our meal was $17 for two people. Those are some expensive fried potatoes. Overall, a disappointing visit. The trend continued as we headed next door to Wired Bistro. The staff was very friendly and service was excellent. They even brought us water while we waited for our takeaway box. I ordered a lemon-sugar crepe. 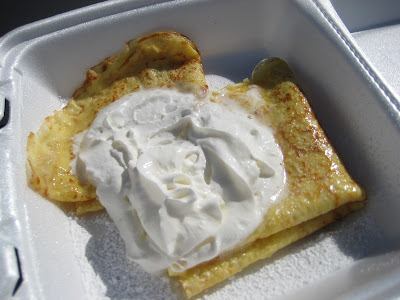 I was disappointed to see it doused with whipped cream, but the crepe really took me aback. It was very eggy and dense, like a thin omelet. It was undercooked, too thick, and contained too little flour, which was disappointing. All the crepes I've had in San Diego have been dense and doughy. I've kind of given up on finding one that's crisp, light, and a bit tender in the middle. It exists on this side of the pond, as I found it at Profi's Creperie at Reading Terminal Market in Philly, but not here, yet. The mission continues! If you are looking for a good Chicago style hot dog (or sausages, or Italian beef)you must try Portillo's in Buena Park. 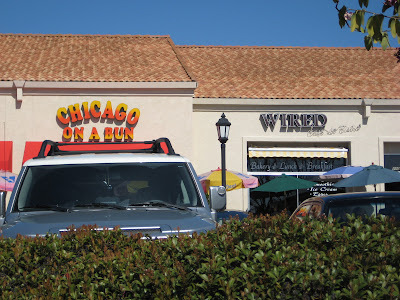 It is a popular chain in Chicago and surprisingly they opened a restaurant in CA. They definitely don't skimp on toppings. Ooooh! We'll have to go there on our next trip to LA. Thanks! Have you been to La Creperie on 30th in North Park? They're a bit heavy as well, but they do make a good crepe. I have and, yeah, they're a bit too heavy. What I'm looking for would probably be considered a bit dry compared to what I've found in So. Cal. Delicate, not too eggy, still pliant enough to fold. The owner of La Creperie, who's from France, told my mom that he couldn't find flour milled fine enough for a truly Parisian texture. Well, I suspect that he could, but that kind of flour doesn't come cheap and he'd have to raise prices to a point where people wouldn't buy. I used to eat at Chicago on a Bun until I found a better place that uses all the exact same ingredients. 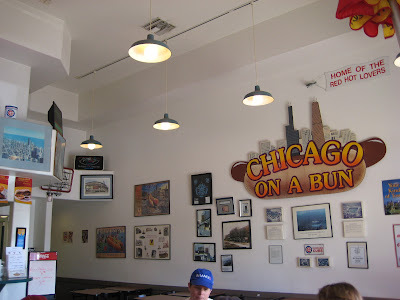 Viva Chicago Hot Dogs on Miramar (5 minutes away.) Same buns, same hot dogs (Vienna signs everywhere.) They have awesome Italian beef sandwiches, and everything is cheaper and way FASTER. 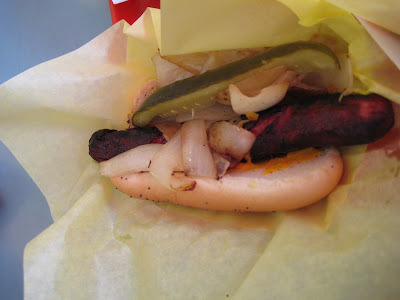 My biggest gripe with Chicago on a Bun was how long it took to make a hot dog. I'd watch people order cooked sandwiches after me, then get theirs before my two Chicago dogs we're "made". Viva Chicago Hot Dogs is in a ghetto strip mall, but that's not something that bother's me.